Larry Schwarm stands in front of photos included in the Wichita Art Museum's new exhibition, "No Mountains in the Way." A collection of documentary photographs from 1974 is currently on display at the Wichita Art Museum. Black and white images of farmers, haystacks and shop fronts provide a look at rural Kansas as seen through the lens of three photographers. KMUW’s Sean Sandefur visited the gallery with one of those artists and has this report. Inside the Wichita Art Museum, looking at work he created 40 years ago, is a man with deep roots in Kansas. Larry Schwarm teaches photography in the School of Art and Design and Creative Industries at Wichita State University. He grew up in Greensburg, Kansas and studied photography at the University of Kansas. He stands before gallery walls lined with dozens of black and white photographs taken by himself and two other artists in the summer of 1974. The exhibition is called ‘No Mountains in the Way,’ and was the idea of a fellow photographer. The Farm Security Administration, or FSA, was part of Franklin Delano Roosevelt’s New Deal campaign. 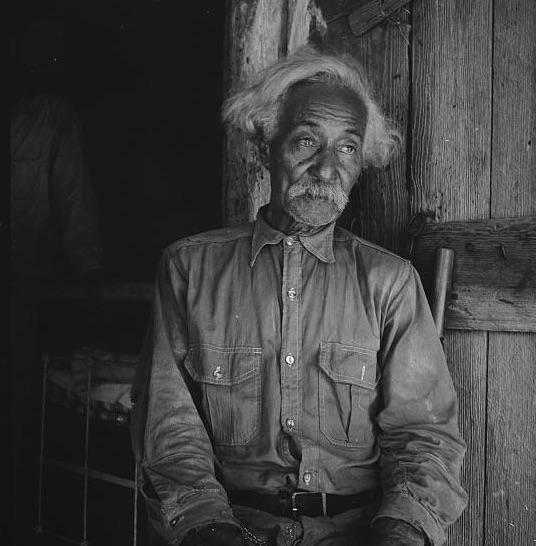 It sought to address rural poverty during the Great Depression. In order to show Congress the plight of families in places like Oklahoma and Texas, the federal government paid dozens of photographers to travel across the U.S. from 1935 to 1944. The work of Walker Evans, Dorothea Lange, Arthur Rothstein and others showed the weathered faces of farmers and their empty fields, the despair and anxiety of mothers and their children. But they also showed resilience. Much like the government-funded artwork of the FSA, Larry Schwarm, Terry Evans and James Enyeart—all of whom lived in Kansas in 1974—used a National Endowment for the Arts grant to document the rural corners of the Sunflower State. Schwarm wasn’t exactly thrilled at being assigned to document the landscape of Kansas. He was much more interested in documenting people. But Enyeart had a feeling Schwarm would produce intriguing work with agriculture as his backdrop. Many of his photographs are square—about the size of a greeting card, matted in white cardboard with silver frames. Rural life—with its haystacks, barns and tractors—might not seem captivating. But dramatic lighting and the use of patterns, shapes and varying tones, transform their banality. 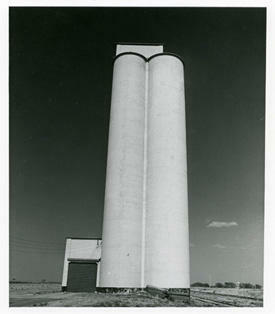 Two of Schwarm's compositions depict grain elevators, photographed close to their base, looking up at the tall structures. A vibrant blue sky is represented in dark gray. Schwarm says he’s always been attracted to these monoliths. To him, they’re the landmarks of western Kansas. He likens them to the cathedrals of France. “About every ten miles [in Kansas], there’s another small town. And every town has a grain elevator. When you’re in Greensburg, Kansas, where I grew up, you can look in one direction to Haviland, Kansas, and you can see the grain elevators. You look the other direction, it’s 10 miles to Mullinville, Kansas, and you can see the grain elevators. So, they’re almost like stepping stones," he says. Whereas the two photographs of grain elevators force you to look to the sky, another series of photographs focuses on the earth. The first is unmistakable: Large rocks in the Flint Hills jut out from the grass. The horizon only takes up a small section at the top of the composition. For Schwarm, these rocks represent the impossibility of ever farming here. Juxtaposed against this idea are three photographs of tilled soil, taken in Clay County, Kansas. “Someone pointed out to me that of all the photographs up here, mine are probably the least historical. [In Enyeart's and Evans's photographs], styles have now changed, a lot the buildings have been torn down and new ones have been built," Schwarm says. 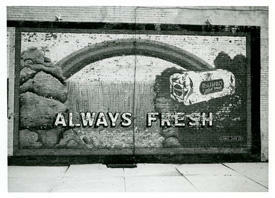 "But [my photographs are historical] in a lot of ways, because these methods of farming are no longer used. You would never moldboard plow like this anymore." Schwarm says he enjoyed documenting the Flint Hills. 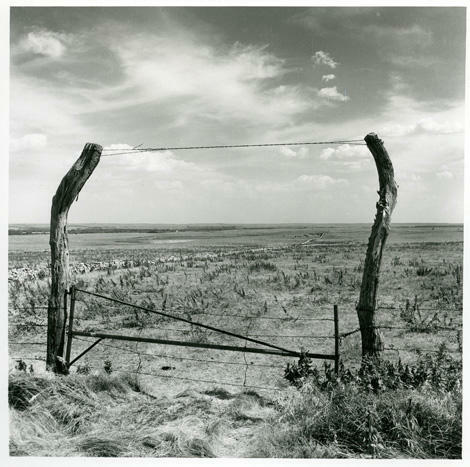 The photograph he is most proud of from this series sits off by itself in the exhibition, and represents a starting point for his journey across Kansas. It’s a wide shot of the Flint Hills, seen through a derelict gate. Two large, wooden posts are barely holding together a metal fence. Larry Schwarm has used this series as a springboard for the rest of his award-winning career. Since ‘Not Mountains in the Way,’ he has gone on to closely document the controlled fires of the Kansas plains and the faces and settings of Kansas farms. He takes a step back to survey the work of Terry Evans, James Enyeart and himself—work that is now archived at the Smithsonian in Washington, D.C.
Schwarm, like the subjects and settings of his photographs, is forever linked to those hot, summer months in 1974. “To have work at an art museum that you did when you were really young, I’d like to think I’ve gotten a lot better. But, when I walked in, I was actually quite proud of them," he says. The photo series ‘No Mountains in the Way’ can be viewed in the Paul Ross Gallery and Scott and Carol Ritchie Gallery at the Wichita Art Museum until Jan. 3. Follow Sean Sandefur on Twitter @SeanSandefur. KMUW art reviewer Lindsey Herkommer-DeVries looks at a new outdoor display. The latest art installations at the Wichita Art Museum won’t be found in the galleries inside the building. Instead, they’re outside, in the newly landscaped grounds that surround the 80-year-old museum downtown. The two new sculptures and the artistic landscape design are the foundation for the museum’s new “Art Garden,” which opens Saturday.